Goodwell has created a new powered toothbrush which is completely battery free and offers a new kind of ecological friendly and sustainable way to clean your teeth and requires no electricity. What the demonstration video below to learn more about the Be. Toothbrush which is powered by you and is available to backfire Kickstarter with earlybird pledges available from $49 and shipping expected to take place during December 2018. – Battery & Electric-Free – Brushing with Be. means no cables, no batteries, and no problems. Transform your daily brushing routine into a simple 3-step process: put toothpaste on the bristles, give the dial two full twists, hit the power button and let Be. work its magic. – Sustainable – Practice zero waste at home with Be.’s 100% biodegradable brush heads and recyclable build. The first toothbrush that gives you all the benefits of clean teeth, at no expense to the earth. 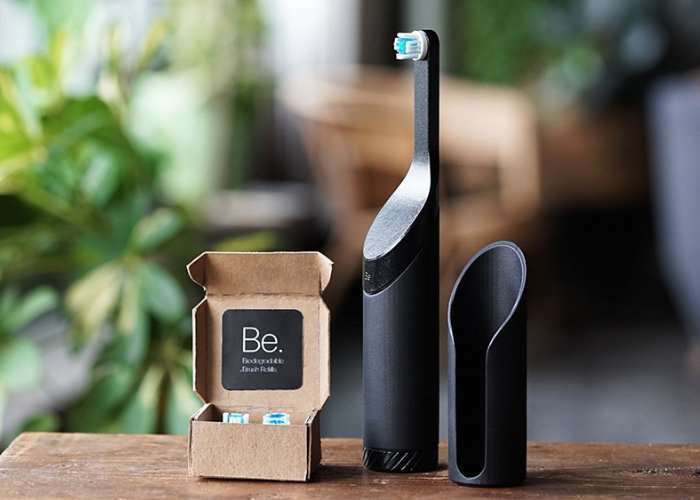 – Smart Technology – Be.’s smart sensor operates at the ADA recommended precise tartar-fighting pressure of 120g, training you to brush thoroughly but consciously. With 80,000 charcoal infused brushstrokes at the perfect pressure, you’re off brushing for a diamond clean smile. – Travel-Friendly – Whether you’re traveling for business, backpacking outdoors or just bringing your toothbrush to work, Be. keeps up with your on-the-go lifestyle. The snap-on case creates an easy to carry cylinder and fits 1 extra brush refill for extended travel. Visit the official Kickstarter campaign page by following the link below for a list of all available pledges and more specifications.